Can Ketamine Keep Depression At Bay? 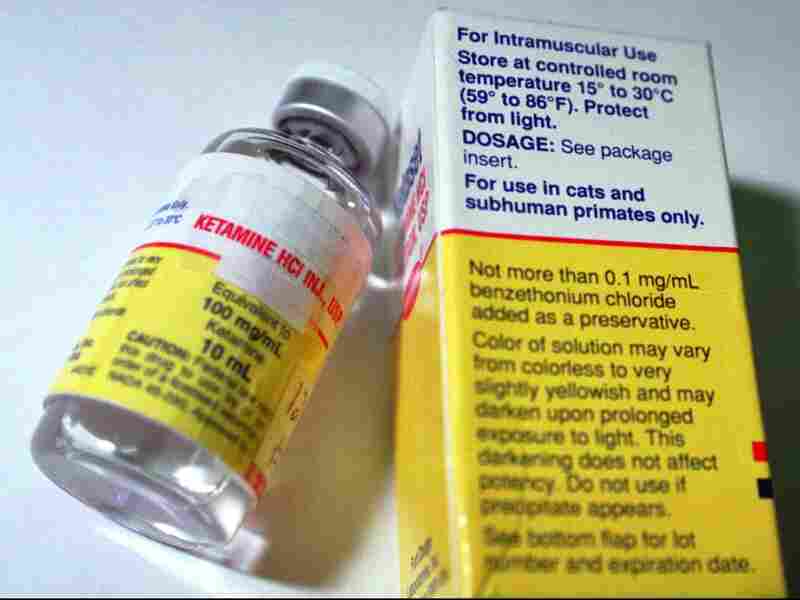 : Shots - Health News There's more evidence that the anesthetic ketamine, sometimes abused as a club drug, has potential as a fast-acting treatment for depression. But patients relapse quickly after treatment with the drug. Can Ketamine Keep Depression At Bay? Ketamine, used as a tranquilizer for animals and as an anesthetic in humans, is also being tested as a treatment for depression. When it comes to profound depression, many people just can't get relief from current treatments. Now there's more evidence that the anesthetic ketamine, sometimes abused as a club drug, has potential as a fast-acting treatment for the condition. Doctors at the Mayo Clinic gave 10 patients ketamine twice a week as an infusion that lasted 100 minutes. All the people had depression that had resisted other treatments. The patients got ketamine until their symptoms abated or they'd had four infusions of the drug. Half the people were pretty much free of symptoms of depression after treatment. And two of those people were still in remission a month afterward. The results were published in the Journal of Psychopharmacology. "It is surprising to see people respond like this," says Dr. Timothy W. Lineberry, medical director at the Mayo Clinic Psychiatric Hospital and a co-author of the study. But, he tells Shots, it's a "pretty evanescent response." People get better quickly, but they also relapse quickly. All the patients except one in this study were taking conventional antidepressant drugs during the follow-up period, it should be said. And in this study, unlike some others, all the patients got ketamine, so there was no comparison group. Both doctors and patients knew that ahead of time, too. "Ketamine works," Lineberry says. "It's safe. The question is how to translate it into a maintenance model." It may turn out that ketamine needs to be given regularly, say, weekly, or, perhaps, an initial course of treatment could pave the way for more effective talk therapy. Lineberry says ketamine treatment remains an area for further study at Mayo, rather than standard practice right now. There are questions about which patients are suited for ketamine therapy — and which ones aren't. The Mayo study, for instance, excluded people with a history of psychotic disorders and previous problems with drug and alcohol abuse. While still not routine, the use of ketamine and related drugs for depression is getting traction. Johnson & Johnson's Janssen drug division has been testing ketamine infusions and a derivative called esketamine that can be taken through the nose. If successful, that approach would make it possible for patients to take the drug outside of a clinic or hospital. The company also says the nasal formula could help minimize side effects, such as hallucinations and anxiety. At a May meeting for investors, the company said early esketamine results looked "promising." The drug is in the second of three phases of clinical studies that are necessary to seek approval from the Food and Drug Administration.